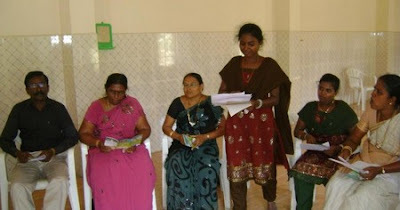 A CCI India Study Session at Tuticorin Tamil India highlighted the ecological problems facing local communities including a major nuclear power project in the region. Nine members of the Tuticorin CCI group took part together with Fr Servatius, Xavier Anthony, MJ Ruben and Glynis Joseph. “The recent people’s movement against the ‘Nuclear Power Project’ was analysed in depth,” he continued. “Fr Servatius who was also involved in the struggle explained as to why the people have intensified their agitation now after 10 years of the starting of construction of the plant. Though initially people agitated, it is only after the experiences of tsnami particularly in Japan and through the advancement of information technology, the people are more informed. The fisherfolk and the people around fear a grave threat to their livelihood if the plan is commissioned. Bishop Yvon Ambroise spoke about his experiences in the YCS and YCW as an animator. He said most of the innovative measures he is initiating in the diocese is because of the formation he received from the movement. 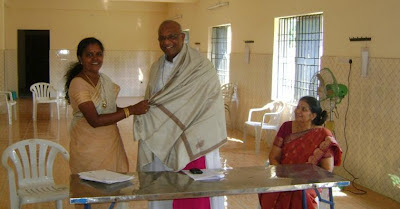 He gives more importance to participation of the laity in all affairs of the diocese. Bishop Ambroise is part of the delegation representing the people’s movement agaist the Koodankulam Nuclear Power Project. The delegation comprising the state ministers and government officials and people’s representatives met Indian Prime Minister on 7 October to press to decommission the plant. Though Bishop Ambroise had to meet the Tamil Nadu Government on the morning of 6 October, he took time to be with the group for more than an hour. Sociologist Prof. X. D. Selvaraj, who is also part of the people’s movement spent a few minutes extending his greetings especially to the National CCI leaders. During the evaluation, the participants felt happy about the training and decided that the CCI group will meet regularly. They will also send their representatives to the CCI India General Assembly next month, Ruben reported.